This comment was created with the J!Tracker Application at issues.joomla.org/joomla-cms/9577. Beats me, but just reading the code I see why it's wrong but no idea why the wrong way would work. Thats what concerns me most - that one of the very few changes that have been made have either created or exposed this issue. PHPMailer now throws an exception which is caught by the exception handler in Joomla and shows the error page. This is why this bug is now exposed, why it worked before and why it no longer works now. 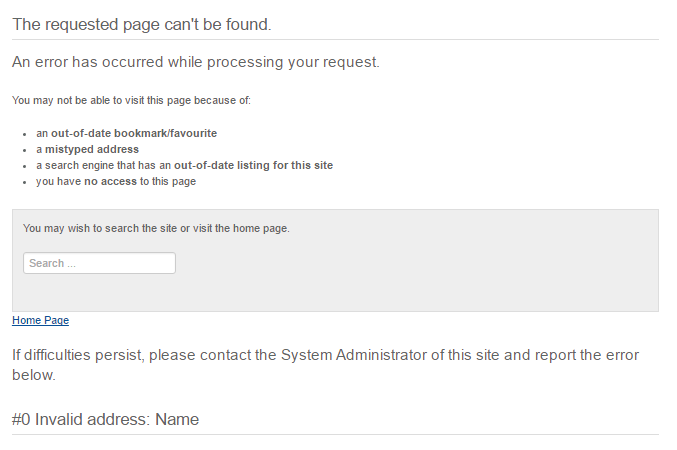 in Joomla and shows the error page. I did a scan through the codebase, this was the only place where the addReplyTo has been used incorrectly. Am I understanding this correctly, that for any third-party extension, that uses the JFactory::getMailer()->addReplyTo () with an "array (address, name) " this will also break the code? If so, is this not also the case for the *JFactory::getMailer()->setSender () *method? Any addXXX method will not work with that array format. You'll have to look at setSender but last I recall it doesn't use the same code as the add methods so that format MAY work. Maybe the JED should issue some kind of warning to the developers? Is that possible? I wouldn't trust the doc blocks as source documentation to be quite frank. You're better off reading the actual method code to decipher what it does and doesn't support. JMail::Send() doesn't actually return a JError object and that's what the doc block says it does as of 3.5.1. It allows an array OR a string. If I submit an array to setSender($from), this function will accept it, but PHPMAILER will throw the exeption? If so, I strongly belief this should be communicated actively to the extension developers, dont you agree? PHPMailer doesn't have a setSender method. That's a Joomla custom thing. Just like the addXXX methods in PHPMailer don't accept arrays as the arguments or implement fluent interfaces like the JMail class does. PHPMailer is throwing an exception if the e-mail address that gets provided into setFrom (either through setSender and whatever format you've injected your param(s) into it or direct calling setFrom) isn't valid. That doesn't need a special message to anyone, that's always been the behavior. The problem is JMail has NEVER, EVER, handled ANY error condition raised by PHPMailer EXCEPT in the Send method. JMail has ALWAYS been silently ignoring errors and continuing operations like nothing could ever possibly go wrong. No amount of communication to extension developers can address that unless you intend on telling them to bypass JMail and JFactory::getMailer() completely in favor of directly using PHPMailer, which to be quite frank that IS my recommendation right now. It will throw the exception if the first argument in your array is not a valid email address, not because you are supplying an array to setSender(). setSender() itself will throw an exception if you supply it with something else than an array or string. Since this has not only broke my custom plugins, other developer plugins, and widely used plugins why didn't anyone think this fix for the mailer would be a big breaking change prior to pushing it? I am not against fixing it. But this should of been a major version change. Not a minor version change. @baconface Who could have expected we all wrote such bad code or perhaps copy/pasted as much? It broke my stuff as well as I found out later than sooner. @roland-d I wouldn't consider what I wrote as bad code when I written it based off the official Joomla API documentation. Because that syntax hasn't worked correctly since 3.0.0 but because JMail does jack nor crap for error handling the errors PHPMailer was rightfully raising were being blissfully ignored and everything looked like it was working beautifully when in fact it hasn't been for the last 3 and a half years. @mbabker Agree with you there and I think we are in for quite a treat when we turn everything into exception handling. @mbabker That is where I am getting at. It is good to fix this behavior. I am not faulting the Joomla team for that. But the fix resulted in broken plugins/codebases. It would of made more since to push the fix off for a major version. At least a better heads up about this breaking change than finding it out by updating. To me, it was just a bad way to approach this fix. Especially since the old/wrong method was encouraged to developers by Joomla documentation. I can't agree with that assessment. We know an API is completely disregarding errors, IMO it isn't acceptable to punt addressing that to a major version bump. Yes, it has probably broken every line of code written for Joomla 3.x that interfaces with the JMail API, but I honestly can't in good faith suggest that until a major version bump happens that JMail should just discard every error that gets raised by it or PHPMailer. You can argue the fact that throwing exceptions is a B/C break. That argument has validity. But the behavior of JMail or PHPMailer didn't change between 3.5.0 and 3.5.1 to start causing the errors that exceptions are being thrown for. If you take a 3.0.0 install and turn on exception throwing in PHPMailer the same errors with the same datasets should be occurring. I think we all agree that fixing the issue was the right thing to do (and following up on this in all relevant 3p-extensions is crusial). Only as a remark on process, a respective note actively pushed by the Joomla team could have prevented a lot of headache for a lot of developers. Maybe for future cases, this could be implemented "somehow"? future cases, this could be implemented "somehow"? This is exactly why this update should of been treated more seriously than a minor update. Except nobody realized how FUBAR JMail was until well after the release. It took a day for me to realize JMail::Send() actually has error handling but it only returns boolean false if the mailer is explicitly disabled (JException objects are returned otherwise, so if (!$mail->Send()) would never get triggered if that was your error checking mechanism). It took me longer to realize that every other part of JMail breaks the PHPMailer interface and has fully discarded all errors. No matter how JMail changed to handle errors, it would have broken more extensions than it would have "fixed" bugs. So I maintain there is/was no way to implement error handling into JMail without some kind of B/C break, and I maintain it isn't acceptable to sit on that until 4.0 because to me there is a higher risk in an API blindly discarding errors than "fixing" extensions to make it look like everything was working correctly when it isn't/wasn't. @mbabker Was it not possible to allow both usages and make the previous/wrong usage deprecated? @mbabker I am not trying to discount your work and I know you meant well. But if I understand what you are saying we went from risking breaking things to breaking things. And that is what I am having trouble making sense of. The wrong usage which hasn't been in the API since 3.0.0? That'd be re-introducing a feature which was already phased out of the API and even then it wouldn't have fixed everyone's issues. addReplyTo() hasn't changed since 3.0.0. The syntax accepted in 2.5 only appeared to work because of the fact that errors were going unhandled. Any change which caused JMail to return errors would have caused that syntax to break. That's the underlying issue. The wrong usage which hasn't been in the API since 3.0.0? If this has been the case I apologize. The API guide for 3.X does show you should send two strings instead of an array opposed to the API guide for 2.5 which instructs you to use an array. However I have not found any migration notes or deprecation notes that identified this as a change. And the API guide doesn't state that it's usage is different unless you just so happened to realize you are no longer sending an array. So if it was deprecated it never made it to any noticeable documentation. Even the largest plugin developers that used JMail were caught off guard by the change. So even though the wrong usage wasn't officially supported it still appeared supported and developers were under the impression it was still supported.